Soccer Moms Ruin Everything - Cars! Cars! Cars! 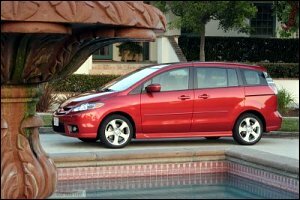 Edmunds reports: Minivan sales down. First they ruin soccer. Second they ruin the perfectly fine act of helping them load groceries into their car by calling the police and saying that: 1. They aren't currently grocery shopping 2. It's 3:30 in the morning 3. They aren't even a mom yet. Pfft, women. Always wantin' the truth. And not to be stalked. Anyway, now moms have ruined the image of the minivan as the studmobile of the future. Sigh. We don't think minivans are over, but manufacturers sure do need to change the name of the things. They ain't mini. They are big, heavy, and full of living room goodness. We'd grab an Odyssey or a Sienna in a heartbeat and hit the open road for the road trip of a lifetime! Or, you know, pick up the chinese take-out because the lady of the house had "one of those days." Think minivans are over? That's a snap of the 2006 Mazda5. It's a real minivan. And it's friggin' cooler than hell. And, yes, that image comes from Mazda itself. Mazda needs to get better pics because a Mazda5 next to a pool and a big planter is just ridiculous. Sheesh! BTW - yes the Mazda 5 is really cool. We ditched the minivan, can still seat the 3 (soon to be 4) kids, and it drives like a car. Dave your right. Also I think wagons are going to continue to grow in popularity. Especially with modern styling like the Magnum so even guys can feel macho driving one. That's where I park my minivan. Seriously I don't have a minivan. The #1 thing I hear from people researching their next family vehicle is the same thing. They want room fro at least two kids, a dog, and all of the stuff they'd need for a road trip. Before I get out the "You need a mini..." I get cut off with "But we don't want a minivan." Every time. These are the same folks that don't want gas guzzling suvs. That's why I think the Saturn Outlook and GMC Acadia will be huge sellers.